Chef Tyler Florence runs Wayfare Tavern in the Financial District of SF, so that was a necessary stop. The meal started with a caesar salad that included some sardines and runny poached egg. Each bite had a bit of rich saltiness with a touch of tang; this is how every salad should be balanced rather than just being drenched in dressing. Next came the Kobe Tartare topped with an egg yolk and served with a side of a puff pastry topped with a pesto and cilantro sauce. This is one of the best things I have ever eaten and nearly warranted an additional order. The next two dishes of string beans and mushroom ravioli were good, but nothing to rave about. The string beans were surprisingly good while the ravioli was a little too rich for my taste. The coup de gras was the Poutine. Each bite just melted in my mouth. It reminded me of an amazing beef pot pie from my childhood and nearly brought tears to my eyes. The fries just melded with the beef and sauce creating a perfect balance of salty and creamy. 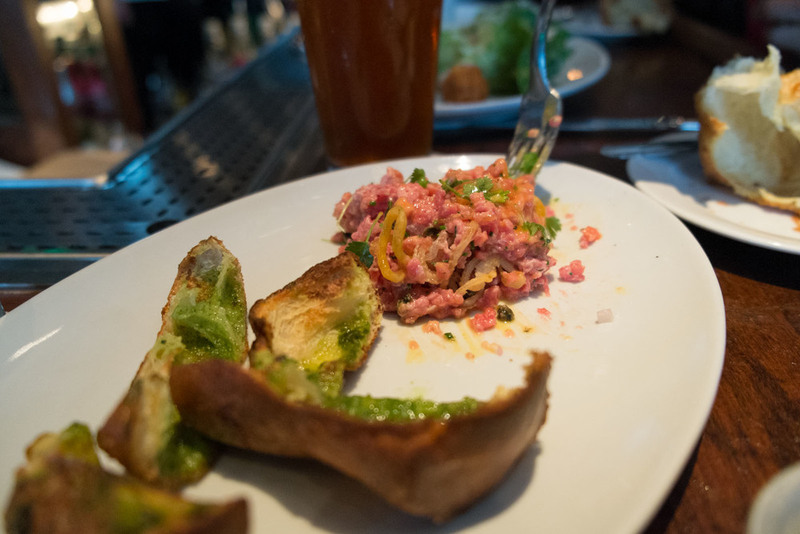 The poutine and the kobe tartare are reason enough for me to return to SF. The meal was finished off with some complimentary small bites of a coffee cake leaving me completely blown away. The service was great, the atmosphere was relaxed, and Wayfare is just a great stop for some very good food.